Dr. Weng-Lang Yang is Professor at the Feinstein Institutes for Medical Research and in the Department of Surgery at Zucker School of Medicine. 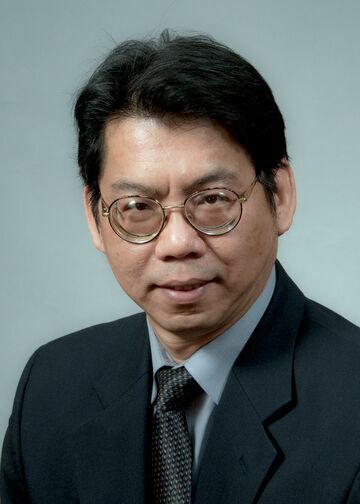 He received his BS degree from Fu Jen Catholic University in Taiwan and PhD degree from Rutgers University, New Brunswick, New Jersey in 1996, studying enzyme purification, kinetics and the phospholipid metabolism pathway. Dr. Yang did his postdoctoral training at the Cancer Institute of New Jersey, studying cancer biology and signal transduction pathways. He then joined the Albert Einstein College of Medicine, Bronx, New York and became an Assistant Professor of Surgery in 2002. He moved to the Feinstein Institutes and Northwell Health in 2005. Dr. Yang’s early research interests focused on cancer progression and treatments, especially in colorectal cancer. He used human colorectal tumor xenograft mouse models to study cellular responses to surgical cryo- and radiofrequency ablations in solid tumors. He also studied the role of bone morphogenetic protein-4 in regulating colorectal cancer metastasis. The first paper published from this work has been highly cited, including by Nature Cancer Review. In 2010, Dr. Yang shifted his focus to the study of cellular, inflammatory and immune responses in various organs damaged by ischemia-reperfusion, hemorrhagic shock, septic shock and radiation. He is also interested in developing recombinant proteins and peptides for the treatment of organ injury under various medical conditions. Dr. Yang’s scientific work has resulted in the publication of more than 95 peer-reviewed articles in cancer and critical care research areas, including one in Nature Medicine. He has served as Principal Investigator for one U01, five R43 and two R44 NIH grants, and as Co-investigator for one R21, three R01 and one R35 NIH grants. He has also served as Associate Editor of Molecular Medicine and Chair of the Awards and Honors Committee (2016-18) for the Shock Society. Throughout his career, Dr. Yang has mentored more than 30 trainees, including postdoctoral research fellows, surgical residents, PhD candidates, and medical, college and high school students. Most of these mentees have had their work selected for podium presentation at local and national scientific meetings, including the American College of Surgeons, the Academic Surgical Congress, and the Shock Society. Many of them have also received awards from local and national scientific societies. Dr. Yang’s research focuses on studying cellular responses and molecular mechanisms that cause organ damage under various medical conditions, and on developing therapeutic interventions to attenuate these organ injuries. I/R-induced organ injury is a major concern for patients undergoing surgical operations such as transplantation, tumor resection and cardiovascular procedures. It can also occur when the arterial blood pressure falls during trauma, hemorrhage and septic shock. Despite advances in preventive strategies, there is no effective treatment for I/R injury other than support with volume replacement and vasopressor agents. Therefore, one of Dr. Yang’s areas of interest is to study the pathophysiology and molecular mechanisms of I/R-induced organ damage and develop therapeutic interventions for I/R injury. Currently, he is investigating the roles of infiltrating macrophages in regulating the inflammatory and tissue repair processes after I/R in kidneys. Today there is a growing threat of severe radiation injury from nuclear plant leaks and international terrorism. Exposure to high doses of radiation in a short period of time causes a medical syndrome known as acute radiation syndrome. All organs can be injured by radiation, and the severity of damage depends on the radiation dose. After the bone marrow, the gastrointestinal tract is the second most vulnerable organ system to radiation exposure. In addition, endothelial cell injury is another important factor contributing to organ damage after radiation exposure. Dr. Yang has participated in identifying that milk fat globule-epidermal growth factor-factor VIII (MFG-E8) and human ghrelin can mitigate intestinal injury and vascular leakage in rodents after total body irradiation. He is currently elucidating the molecular mechanisms and pathways utilized by these two molecules in preventing organ injury after irradiation, and developing them as therapeutic countermeasures to radiation injury. Yang W-L, Ma G, Zhou M, Aziz M, Yen H-T, Mavropoulos S, Ojamaa K, Wang P. 2016. “Combined administration of human ghrelin and human growth hormone attenuates organ injury and improves survival in aged septic rats.” Mol Med 22:124-35. Khader A, Yang W-L, Godwin A, Prince JM, Nicastro J, Coppa GF, Wang P. 2016. “Sirtuin 1 stimulation protects against hepatic ischemia-reperfusion injury by enhancing mitochondrial function and autophagy.” Crit Care Med 44:e651-63. Yang W-L, Sharma A, Wang Z, Li Z, Fan J, Wang P. 2016. “Cold-inducible RNA-binding protein causes endothelial dysfunction via activation of Nlrp3 inflammasome.” Sci Rep 6:26571 (10 pages). Yang W-L, Sharma A, Zhang F, Matsuo S, Wang Z, Wang H, Wang P. 2015. “MFG-E8-derived peptide attenuates organ injury and improves survival in sepsis.” Crit Care 19:375 (13 pages). Mulchandani N, Yang W-L, Khan MM, Zhang F, Marambaud P, Nicastro J, Coppa GF, Wang P. 2015. “Stimulation of brain AMP-activated protein kinase attenuates inflammation and acute lung injury in sepsis.” Mol Med 21:637-44. Godwin A, Yang W-L, Sharma A, Wang Z, Nicastro J, Coppa GF, Wang P. 2015. “Receptor-interacting protein kinase 3 deficiency delays cutaneous wound healing.” PLoS One. 10:e0140514 (17 pages). Wang Z, Yang W-L, Jacob A, Aziz M, Wang P. 2015. “Human ghrelin mitigates intestinal injury and mortality after whole body irradiation in rats.” PLoS One 10:e0118213 (18 pages). Khader A, Yang W-L, Kuncewitch M, Jacob A, Prince JM, Asirvatham JR, Nicastro J, Coppa GF, Wang P. “Sirtuin 1 activation stimulates mitochondrial biogenesis and attenuates renal injury after ischemia-reperfusion.” Transplantation 98:148-156. Matsuda A, Yang W-L, Jacob A, Aziz M, Matsuo S, Matsutani T, Uchida E, Wang P. 2014. “FK866, a visfatin inhibitor, protects against acute lung injury after intestinal ischemia-reperfusion in mice via NF-κB pathway.” Ann Surg 259:1007-1017. Matsuo S, Yang W-L, Aziz M, Kameoka S, Wang P. 2014. “C75, a fatty acid synthase inhibitor, ameliorates experimental colitis.” Mol Med 20:1-9. Yang W-L, Perillo W, Liou D, Marambaud P, Wang P. 2012. “AMPK inhibitor compound C suppresses cell proliferation by induction of apoptosis and autophagy in human colorectal cancer cells.” J Surg Oncol 106:680-688.